Spray a 9 x 13 pan. Mix ingredients accept for the 1/2 C saved cheese. Put in greased pan. Sprinkle 1/2 C cheese on top. Bake for 40 - 45 minutes until golden brown. * You could make your own white sauce/cream of soup and skip the can of soup. ** I cooked in crock pot...high for a couple of hours and low until time to serve. I've been told you could cook on low overnight and have it ready to go in the a.m. This looks so good, DeEtta!... 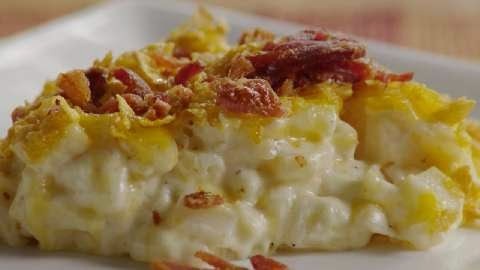 Can't wait for a good excuse to make it :) Is that some bacon that you sprinkled on top?